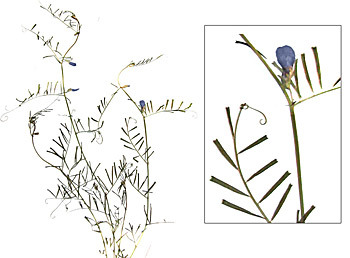 AgroAtlas - Relatives - Vicia peregrina L. - Overseas vetch. An annual plant 20-80 cm in height. Stems are downy, ascending, strongly branched, thin, ridge. Stipules are fine, 2-3 mm in length, on the inferior leaves - semisagittate, on their top - linear, smooth-edged. The axis of the top leaves comes to their end by branchy antenna, the axis of inferior leaves by cusp. The inferior leaves consist from 2-3 pairs of narrow-linear leaflets, average and top ones - from 3-8 pair. A top of a leaflet cut off or retuse, with a cuspt. Lateral veins are not clear. Flowers are 12-15 mm in length, on very short pedicel, in axils of leaves. The calyx is tube-campanulate, oblique; calyx denticles are linear - lanceolate, inferior one is longer and narrower, than top one, top denticles converge together. Corolla is purple. The flag is painted more brightly, than wings. A plate of a flag has deep incision, on claw. Claw is humpbacked. A plates of wings have inversely ovare form, are longer than claw. A plate of keel is almost round. Pods are oblong or linear, up to 4 cm in length, plainly compressed, with rostrellum, coriaceous, brown, with 4-6-seeds. Seeds are 3-4,5 mm in diameter, slightly angulate, velvety. The hilum of a seed is very small, covers 1/10-1/12 part of a seed. Blossoms in April, matures in June. The common distribution: Mediterranea, Balkany-Asia Minor regions, Iran, Boreal Himalayas. In territory of the former USSR: the European part - the Inferior Don and Crimea; Caucasus - all areas, except for Talysh; Central Asia - Syr-Darya region, Tien Shan, Mountain Turkmenistan, Pamir-Alai region. On grassy slopes, weed in crops. A weed in grain crops. Fodder plant, accumulate the high content of a crude protein in green mass - up to 26 %. Flora USSR, 1948. Vol.XIII, Shishkin B.K. & Bobrov E.G. (ed.) - M.-L.: Publishing House of Acad. Science, pp. 466-467. (in Russian). Grossheim, A.A. 1952. Flora of Caucasia. Baku, Publishing House of USSR Acad. Science, Vol. VI, 389 p., appendix. (in Russian). Herbarium Specimans - Vavilov Institute of Plant Industry (SPb, Russia), Komarov Botanical Institute (Spb, Russia).